All our services (work contract) and (goods) deliveries (purchase agreement) will be subject to the following provisions. These also apply to all future business relations even if they are not again explicitly confirmed. The general terms and conditions take place over the entire course of business, whether it is a merchant according to the Commercial Code or non-commercial clients business partners. They apply to the entire business relationship with our customers. Otherwise terms are expressly rejected. Oral amendments are only valid if they are expressly confirmed by us in writing. The customer acknowledges these conditions by the possibility to acquaint themselves with, and in particular by opening a safe packaging or by breaking License sealing or the product attached Note bands even when you take the customer only with the delivery or service to the attention. With performances by master perform, which are directed to delivery, modification or adaptation of computer or control data with or without modification of hardware, the customer accepts the order expressly in these terms and conditions contained Disclaimers and undertakes to respect them. Offer: Our offers are not binding. Additional necessary services and materials are based on the incurred expenditure. A contract comes into existence only when we confirm the order in writing or deliver the goods or perform the services. Verbal collateral agreements are only valid if they are confirmed by us in writing. Delivery and Performance: The delivery and performance times are specified by us as accurately as possible. However, they are not binding, unless expressly stated in writing binding dates and deadlines agreed. A delivery period shall be deemed fulfilled as soon as the parts are reported ready. Partial deliveries are allowed. Delivery and performance disorders: Will we hindered in the timely performance of the contract through procurement, manufacturing or delivery disturbances with us or our s suppliers, eg .By power shortage, traffic disturbances, strikes, lock-outs, shall be extended the delivery or performance period appropriately. , The customer can only withdraw from the contract if he is writing us a reasonable grace period after expiry of the grace period. The resignation must be in writing, if we do not comply within the grace period. If we fulfill the contract for delivery or performance failure wholly or partly impossible, we are released from our delivery or service obligation. About delivery or performance faults and our inability to provide or afford to, we will notify the customer immediately. Compensation: Compensation claims by the customer due to delay or non-performance are excluded unless we are guilty of intent or gross negligence. Retention: If the customer with the payment of a previous delivery or service in default, we are entitled to withhold deliveries or services, without being obliged to compensate any loss incurred. Transfer of risk: All deliveries are made ex works at the expense and risk of the customer, if no other agreements have been made. Insurance of the goods against transport damage or other risks only at the express request and expense of the customer. The risk passes to the customer once the goods leave our factory or warehouse. All shipments, including any return travel at the risk of the customer, with the exception of returns that occur due to a defect in the goods. In services, the risk passes upon acceptance to the customer. The goods remain our property until payment of all, including future, demands from our business relationship with the customer. The customer may sell the reserved goods in the ordinary course of business and only against immediate payment or with further retention of title; to any other dispositions in particular for the transfer of ownership and to pledge he is not entitled. Assignment: The Customer hereby assigns his claim from the resale of the reserved goods to us. The assignment is only in case of default of payment disclosed. If reserved goods are sold with goods of third parties together, the assignment is limited to the invoice value of the goods. Recover the debt: The customer is entitled until revocation to collect the receivables assigned to us. An assignment or pledge of these demands is only permissible with our written consent. Release: If the value of the assigned claim, the amount of our claim permanently by more than 20%, we shall release the fuse on the customer’s request. The customer after their receipt to check the goods immediately for obvious defects and this in writing to us immediately. Hidden defects must be reported in writing within 5 days after their discovery. General Warranty: We warrant that our goods are free from manufacturing and material defects. The warranty is limited exclusively to the intended use of the goods delivered by the customer. The warranty is subject to selection of the master perform GmbH at its site in Plüderhausen by free replacement or free repair of parts recognized as defective by performing master GmbH. Replaced parts become the property of the master perform GmbH. For the built-in repair or remedial parts until the expiry of the guarantee period of the purchased item warranty is provided under the contract. Evidence of defectiveness of the built-perform master GmbH parts must be provided by the customer. Has the contractor over perform master GmbH programming devices and software for self-programming of the tuning modules of the warranty – or warranty claims excluded. Improvement: the case of delivery of defective goods or manufacture of a defective work, we will eliminate, at our option the defect or deliver a new product or new construct the piece. After finding the error perform master GmbH is immediately provide the possibility of repair. If a defect Experiment 2 – times failed, the customer can withdraw from the contract. A claim for replacement does not exist for tuning performance of the specific nature of the business. Liability: The warranty is void if the customer or third parties without our prior consent modified parts of the goods or the work or damaged, or consumables are used which do not meet the original specifications and for violations of the terms of warranty. The same shall apply for ignoring the assembly instructions assembly and resulting damage or that maintenance requirements of Fahrzeugherstellersund additionally created by perform master GmbH Maintenance and warnings have been ignored or have been installed in the vehicle by performing master GmbH unapproved parts or built from perform master GmbH Parts be installed in another vehicle. The warranty also expires if the customer of his reprimand not immediately after coming and has been given the opportunity to perform master for rectification. Further claims of the customer, especially on the controller, the motor or other vehicle aggregates and parts, expansion – and installation costs, as well as damages that are not the object of delivery concern (in particular consequential damages, whether material or immaterial), Video- extent legally admissibility excluded , There are ruled out within the legal framework of further consequential damages auspositiver infringement or due to warranty law. This particularly applies to claims for loss of use and car hire costs incurred. Perform master GmbH is liable only insofar as they are caused by of perform master GmbH built, incorrect, ie improperly functioning parts for damage to the engine or the other parts of the vehicle. When installing a new control chip / module perform master shall be liable therefore expressly only for the vehicle, which is caused by a defective chip / module. Liability for damage caused solely due to the higher engine load, is excluded. Limitation of Liability: We are liable notwithstanding the legal basis in full amount of damages in case of intent and gross negligence, as well as any injury to life body or health. In all other cases, liability is limited to replacement of the typically foreseeable damage legally up to the amount of the contract value per claim. We are not liable for slight negligence, unless essential contractual obligations have been violated. Warranty period: perform master GmbH assumes therefore a guarantee of two years from the transfer of risk for the parts supplied by it. The warranty period for industrial users is limited to one year. The calculation is performed at the rate applied on the day of delivery or completion of performance rates, as long as no special agreement has been made. All goods prices are Euro – Prices ex works plus VAT exclusive packaging, transport, insurance or other ancillary costs. All services are as Euro – Prices plus value added tax. Invoices are due within 14 days of the invoice date without deduction. The acceptance of checks made at our discretion and only as payment. The credit will be only under usual reserve. The customer is only entitled to offset or on the plea of ​​retention if the counter-claims have been legally established or are undisputed. Please note that become known in connection with the business relationship personal data are processed in accordance with the Federal Data Protection Act. We sell both products with TGA and ABE as well as non-approved products (racing purposes, export, etc.). For products with no TGA or ABE examination of the letter goes if necessary at the expense of the purchaser. As far as brought about by our services or the use of our products changes in the performance of vehicles, extinguished the operation of motor vehicles. The vehicle no longer corresponds to the StVZO result of such changes, and may lose its insurance coverage. There is (etc. eg TÜV, Dekra) cause for the buyer in accordance with statutory provisions, the obligation to notify the changes occurred the approval body and his car insurance and if necessary, a technical vehicle inspection. If the buyer nevertheless guides the vehicle on public roads, you do so at your own risk. We expressly assume no liability for damages of the purchaser or third parties arising from the non-observance of these notes and the statutory provisions. The customer is pointed out and acknowledges that the benefits conferred by perform master GmbH, products, tuning measures, as well as the changes made as part of the tuning on the vehicle, the engine, the control unit or the control data in a change in performance customer lead vehicle. The customer is hereby noted that the engine and possibly also other vehicle aggregates and parts of the vehicle a higher stress and strain are exposed and this physical reasons may occur at the customer’s vehicle to a higher wear. In particular, overstressing and permanent services can, and the impact achieved by the tuning increasing the maximum speed of the vehicle to the customer life of the vehicle, the engine and its aggregates. It is explicitly noted that design changes and power changes could void the warranty of the vehicle. Therefore Perform Master GmbH offers the possibility of entering into an additional guarantee contract. The module may not be exported Tuning in built yet dismantled and returned to the United States. Jurisdiction is at our option, Stuttgart or the general jurisdiction of the customer. For contracts with non-German parties German law applies. All legal relationships between us and the customer the law of the Federal Republic of Germany. Should one or more provisions be invalid, the remaining terms and conditions shall not be affected, the Parties commit themselves to replace the invalid provision by such that the economic purpose of the invalid provision. Your AMG tuning: We are happy to advise you! Call us or send us an email. You can also reach us via our contact form. The PEC tuning unites all AMG chip tuning advantages in just one module: Increased performance including German part approval. The operational safety of your Mercedes-AMG comes first. Because the PEC tuning module starts when the engine temperature of your Mercedes-AMG is sufficient. Significant advantages over a classic ECU chip tuning for a Mercedes-AMG. Just like a classic AMG chip tuning, the tuning with a PEC tuning module is active immediately after installation: more horsepower and more torque for your Mercedes-AMG. As simple as the installation is, so easy is also the retro-fitting in stock perfromance. This is chip tuning for your Mercedes-AMG of the latest generation with a PEC tuning module from performmaster. 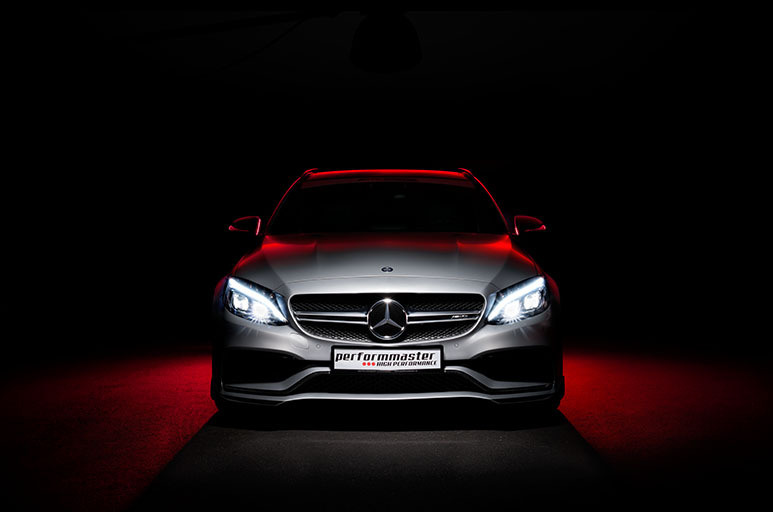 Chiptuning for the Mercedes-AMG with the PEC tuning module by performmaster with the innovative CAN bus tuning technology. Select your Mercedes-AMG here.